Construct a minimum of eight (8) square feet of layout. Again, there is no requirement about how good or how elaborate your layout must be - just that you must "construct" it. On the other hand, you may have trouble convincing someone that a loop of track nailed to a piece of green painted wood constitutes a "layout" . . . How much is 8 square feet of layout? Well, a typical module is 4 feet by 2 feet, and would easily satisfy this requirement. Construct five (5) structures (scratchbuilt, craftsman, or detailed and commercial kits). These structures may be separate, or one or more of them may be part of a single scene. The same comments apply here about the type of kits. The idea is to show that you can do more than glue a simple plastic kit together. Painting or weathering are good things to consider. Remember that "structures" aren't just buildings. Things like bridges and trestles also fall into this category. Three (3) types of trackage are required (turnout, crossing, etc.). All must be properly ballasted and installed on proper roadbed. Commercial trackage may be used. This requirement sounds a lot harder than it is. First, notice that last sentence about commercial trackage; you don't have to hand-lay anything - you can just install a store bought turnout. "Types of trackage" can be just about anything: turnouts, crossings, and grade elevation (a change in elevation of the track) are all examples of "types of trackage". Also, note that the three types DO NOT have to be different. For example, just having three simple turnouts will qualify. The "proper roadbed" requirement can be met by laying the track on a raised roadbed, ( such as cork ) and ballasting it. The purpose of this requirement is to show that you understand roadbed profile, drainage, etc. All installed trackage must be properly wired so that two trains can be operated simultaneously (Double-track main, single-track main with sidings, block or command control, etc.). This requirement can also be easier than it sounds. Notice the option for a single track main with sidings. This means that as long as you can cut power to the sidings individually, you can run one train, park it on a siding while you run another, then park it and run the first again. This meets the requirement. Provide one additional electrical feature such as powered turnouts, signaling, turnout indication, lighted buildings, etc. Don't read more into this than is there. A powered turnout can be something as simple as an Atlas turnout with a switch machine. Think in terms of anything that runs off the 'Accessories' terminals of a power pack and you 're half way there. My first contact with the AP (Achievement Programm) was during a clinic in 1997 when I attended my first NMRA convention in Madison, WI. Although at first thought it seemed like a goal that I could not reach outside the US, but nevertheless I wanted to give it a try. 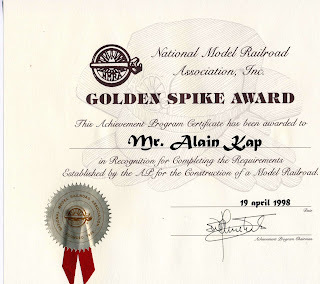 Having already build some modules and a home layout with a couple of shake-the-box cars, I applied for the Golden Spike Award, which I received in 1998. The first step was done. But that was only the beginning. What would come next was a journey that still lasts to this day. Don't get me wrong. I'm not complaining nor keeping anybody away from getting started. Let me explain my approach and you'll understand why it took me so long to achieve. Living outside the US without belonging to a Region left me all by myself - at first sight. But I also realized that the requirements for many of the certificates would each take me at least one year to complete, so it gave me enough time to plan ahead. My intention was to complete as many models as possible and take them with me to the next convention I attended.